Pyle Bluetooth Vertical Turntable can rip your vinyl tracks to MP3s | What Hi-Fi? The retro-styled turntable is equipped with Bluetooth, so can stream tunes from any Bluetooth-enabled device like a smartphone or tablet. Pyle's latest turntable might be dripping in retro charm, but don't be fooled: it's a thoroughly modern device. The Pyle Bluetooth Vertical Turntable (or PLTT21BT) has Bluetooth for playing music wirelessly from smartphones and tablets. 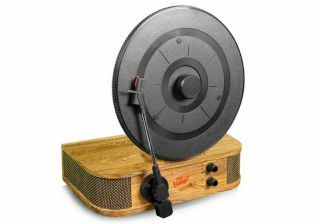 Of course it plays records too, at 33.3, 45 or 78rpm, and does so with a modern twist - it lets you digitise your vinyl collection. MORE: Wheel by Miniot - the most minimalist turntable ever? Hook it up to a PC via USB, and you can transfer all your vinyl records to digital audio files for easy playback. The only other similarly priced turntable we've seen recently that offers vinyl ripping smarts is the Audio Technica AT-LP60-USB, although with its integrated amp and speakers the Pyle is a more direct rival for the frankly dire Crosley Keepsake. Using the RCA line, it also connects to home cinema systems to provide some extra oomph using its built-in stereo speakers. The Pyle PLTT21BT is available now, priced $120 (£100) from Pyle's website.